Express yourself using a variety of wireworking techniques in this 6 hour workshop. 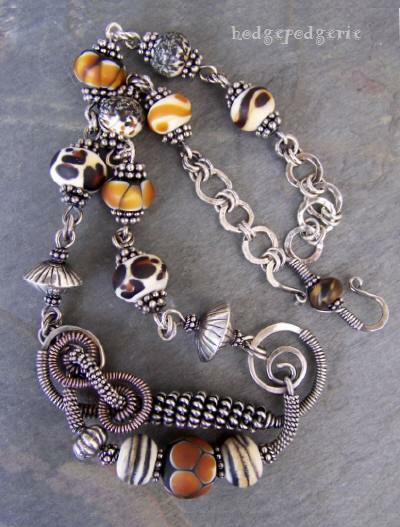 You'll twist, coil and manipulate copper wire, adding your beads to create a one-of-a-kind piece of wire art jewelry that truly expresses your individuality. For a pleasing contrast, you may also use Sterling silver wire in your design. All skill levels are welcome. However, basic wireworking skills such as those taught in my Basic Wire Jewelry Techniques I class are recommended. "What a fun class, Stacy! I can't wait for the next one!" 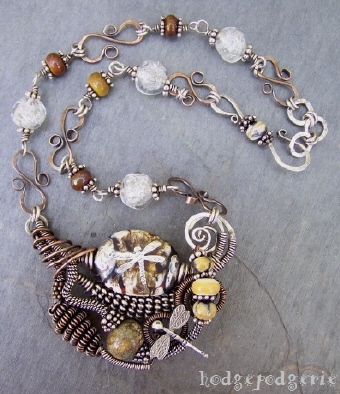 Return from "Wire Collage Pendant" page to "Wire & Metal Jewelry Classes" page.